Last year, one of the beers I earned a silver medal for at the Ohio State Fair was an Australian Sparkling Ale. Although I did not enter that beer this year, I did decide to re-brew it. The beer was a hit with friends and family. This re-brew attempts to reproduce the award-winning beer in the Zymatic instead of The Grainfather. I've attempted to adjust grain volume and hops amounts down to a level that should be equivalent. I added Carapils to this iteration to help maintain a head. The Roasted Barley was added to increase the malt complexity. I'd wanted to add Carafa III Special as I did in the original version, but didn't have any on-hand. Roasted Barley seemed like a good alternative and is often used in British brewing, which in some respects is the spiritual birthplace of Australian brewing. We'll see if this negatively impacts the beer. All the fermentable ingredients, including the corn sugar and pH 5.2 Stabilizer, were added to the Zymatic's step filter. I programmed a delayed start for the next morning around 7:30am. I figured it would be humming along by the time I finally woke up. Sure enough, it was. The Zymatic's high-efficiency mash profile was used. As with other beers made in the Zymatic, I've adjusted the hop additions based on BeerSmith's calculation of bitterness. That's because, in this case, I'm trying to reproduce a beer that BeerSmith calculated as having about 31 IBUs. Apparently, Picobrew calculates the same beer as 23 IBUs. Either way, I will hopefully get the same bitterness level as the award-winning beer. A 60-minute boil was scheduled, with a hops addition at 60 minutes and again at 5 minutes. 05/27/2018: I wanted to test the Delayed Start feature of the Zymatic, so I loaded the ingredients into the Zymatic and selected the Delayed Start option. I calculated the number of hours and minutes between the current time and 7:30am, then told the Zymatic to wait that long before brewing the recipe. It seemed to be working, so I went on to bed. 05/28/2018: The Zymatic kicked off the brew as expected, at 7:33am. The brew finished around 11:45am (roughly four hours later). Owing to the small all-barley grain bill, there was not too much foaming and no overflow from the step filter. That makes this an ideal recipe for a delayed start and an unattended brew, as there is little risk of a mess. 05/29/2018: While I suspect that fermentation is underway, there was no activity visible in the airlock. Given that the beer has about 4 gallons' worth of head space, this doesn't surprise me. It is more likely that airlock activity will begin tomorrow. 06/10/2018: Fermentation appears to be finished now. Gelatin was added, and the beer was moved into the mini-fridge to brighten before bottling. 06/16/2018: Bottling day has arrived. 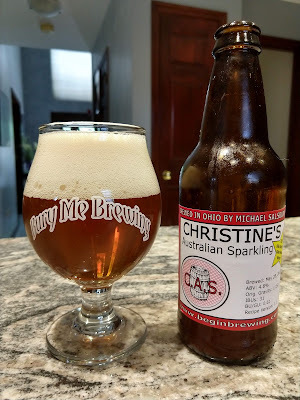 06/20/2018: A bottle was opened to see how the carbonation and flavor are progressing. The beer still has a hint of diacetyl to it, but a nice amount of carbonation. The flavor when very cold is disappointing. I think the roasted barley offsets the somewhat subtle flavor of the Pride of Ringwood hops, where the Carafa III that I used in the previous version did not. As the beer warms, it sweetens a little, and the contribution from the roasted barley becomes less intense. I still don't think it's as good as last time. I'll re-brew again with the right malts. 06/25/2018: The bottles were labeled tonight, which is the first step toward sharing them with friends and family. 07/18/2018: The beer pours a fairly clear deep gold with thick white head that lasts a while, leaving behind lacing. The aroma is malty, slightly sweet, and a touch fruity. The diacetyl flavor is gone. The roasted barley has mellowed somewhat but still seems to dominate the flavor. Don't get me wrong, it's a drinkable beer, just not the equal of last year's medal-winner. Finish is clean, slightly roasty, and very slightly bitter.